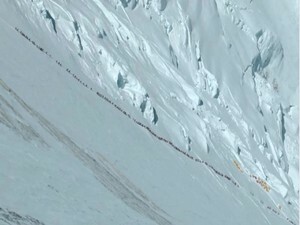 Mount Everest Has A Poop Problem. A Team From Seattle Wants To Clean It Up. by Courtney Flatt Follow NWPR/EarthFix Nov. 17, 2017 4:46 p.m. | Updated: Nov. 20, 2017 12:05 p.m.
Northwest engineers hope to build a digester for human waste in Gorak Shep, a tiny village in Nepal near the Mount Everest base camp. A porter carries a barrel of human waste from Mount Everest base camp to the small village of Gorak Shep. team has spent seven years working on fixes. And their work hasn’t gone unnoticed. This year it was awarded the 2017 Mountain Protection Award from the International Climbing and Mountaineering Federation. 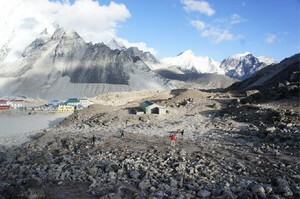 “There are multiple benefits for the ‘downstream’ Sherpa population (notably less polluted water) and providing the project proves a success, this technology can be applied to other high altitude mountain locations where climbers and/or trekkers have created a waste disposal problem,” said commission member Stephen Goodwin in a news release. Waste has become a huge issue on Mount Everest, as many climbers try to reach the summit every year.